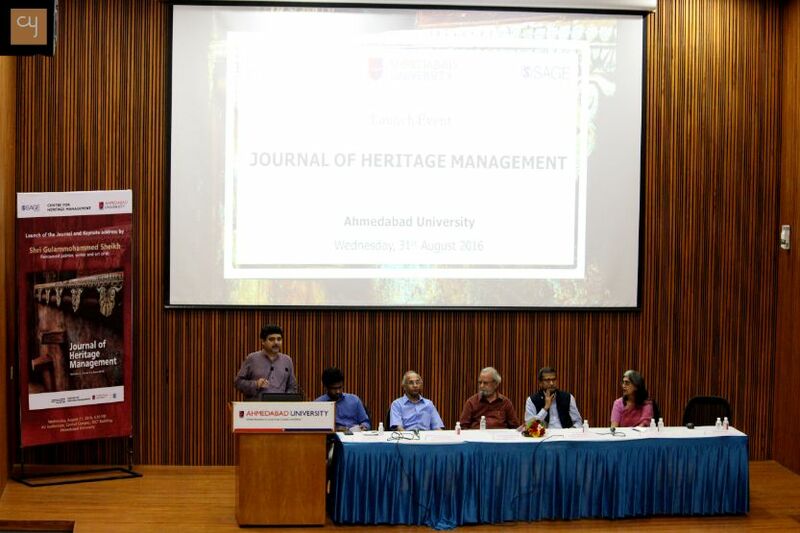 On the 31st of August, Centre for Heritage Management (CHM), Ahmedabad University(AU) launched a peer-reviewed international Journal of Heritage Management, the first of its kind in the country. 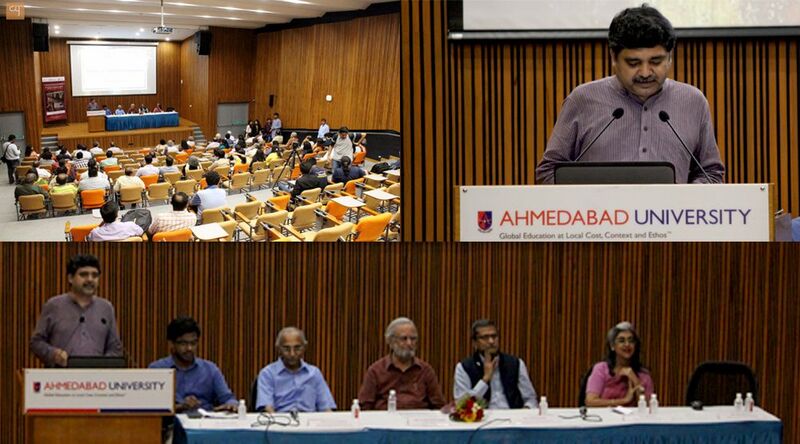 The event was held at the AU Auditorium, Central Campus, GICT Building, Ahmedabad University. The Journal published by Sage Publication, was launched by the preeminent artist, writer and educationist Shri Gulammohamed Sheikh. The Journal of Heritage Management aims to bring together theoretical discourses and practical implications of ‘heritage management’ as a field of research and practice. The Journal will be a forum for sharing theoretical discourses, analysing policies and practices, and promoting discussions on key issues on heritage management. The Journal is multidisciplinary in nature and includes disciplines such as Art History, Architecture, Archaeology, Anthropology, Ecology, Biodiversity, Cultural Geography, History, Cultural Studies, etc. it aimed at academicians and professionals from these disciplines, who may have a focus on heritage and its management. Present for the launch along with Shri Sheikh were- Professor Pankaj Chandra, Chairman & Provost, Ahmedabad University; Professor Devanath Tirupati, Dean, Amrut Mody School of Management, Ahmedabad University; Shri. Debashish Nayak, Director, Centre for Heritage Management, Ahmedabad University; Professor Rima Hooja, Editor of the journal & Adjunct faculty, Centre for Heritage Management and Professor Shahul Ameen, Assistant Editor of Journal. Many important personalities from the arts, culture, heritage and academia in the city like Ms. Archana Shah, Shri Ashoke Chatterjee, Dr. Ratan Parimoo, Shri Prafullbhai Anubhai, Sara Ahmed were also present for the event. Shri Sheikh is an eminent personality in the field of Arts and retired as Professor of Painting at Maharaja Sayajirao University, Vadodara. He has lectured widely on Indian art in different parts of the world like Europe, U.K., USA, Australia. His practice as artist and educationist and the curatorial projects he has initiated contribute to an appreciation of world art history but also locate it within contemporary art and discourse. He bridges a historical appreciation of art and art practice with an engagement with contemporary socio-political concerns. He has been prominent in policy and institutional advocacy, participating in cultural organisations and on national committees. In his lucid and brilliant keynote address, Shri Gulammohammed Sheikh talked about the current state of both artistic & build heritage in India and issues with the institutions responsible for its documentation, conservation and management, citing some examples from India and abroad. He emphasised the need for rejuvenating some these institutions and the need to come up with innovative ways of popularising the rich visual arts heritage and making it accessible. He also advocated the setting up new institutions both at local & national level that will nurture the visual arts as an academic discipline with specialisations in various related subjects. He mentioned the enormous potential and opportunities the city of Ahmedabad has in this field and the advantage of having Centre for Heritage Management at Ahmedabad University. He succinctly talked about all the opportunities and challenges that lie in front of Ahmedabad as well as all of us involved in the culture and heritage sector. 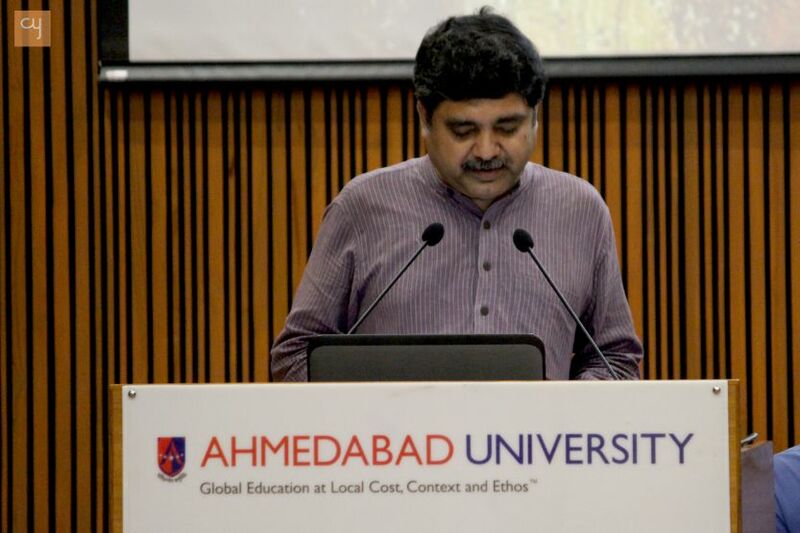 Professor Chandra, Chairman & Provost, Ahmedabad University remarked that Ahmedabad University aspires to be a liberal education-driven research university and this journal truly reflects its movement towards that. As he commented while the world of heritage inquiry in India is largely been practice and documentation driven, its growth in an academic environment will have to be driven by an amalgam of theory, policy and managerial thinking. A peer-review journal is thus an appropriate mechanism for creating a dialogue around conceptual issues, building theories and showing ways of executing ideas and practices. Professor Hooja, the Editor of the journal said that this multidisciplinary journal aims to be a forum for sharing theoretical discourses, analyzing policies and practices, and promoting discussions on key issues on heritage management. Shir Debashish Nayak mentioned how this was another achievement for Ahmedabad University following the launch of a one of its kind Masters programme in Heritage Management in 2015. He also talked about how these events showcase Ahmedabad’s sensitivity and connection with its heritage. This makes the choice of the Government of India to nominate Ahmedabad to be the first Indian city to be a part of UNESCO’s World Heritage process like a wise decision. We hope that this journal will promote academic work and the public’s interest in the field of heritage in the country. We at team CY wish the Centre for Heritage Management all the best for this and all future endeavours.